Showing 1 - 20 of 40 results. 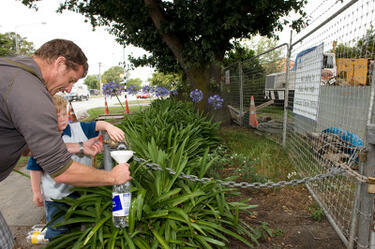 Residents of Burwood filling water bottles from a City Council water supply in Burwood. Many parts of the city were without water following the 22 February 2011 earthquake. 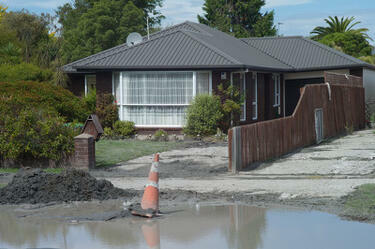 A house in Burwood showing with liquefaction on its driveway. A puddle had formed in the road in front of the house, and is marked by a road cone. 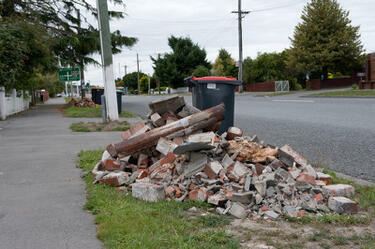 A pile of bricks, insulation, and pieces of chimney flue awaiting collection beside Burwood Road in Burwood. 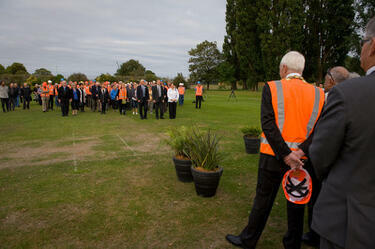 Phil Goff leading the Stronger Christchurch Infrastructure Rebuild Team (SCIRT) as they are welcomed by a powhiri. 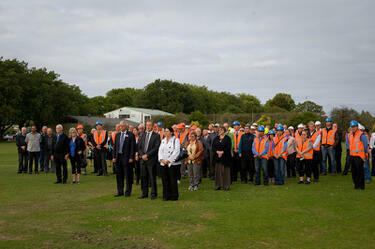 Phil Goff leading the Stronger Christchurch Infrastructure Rebuild Team (SCIRT) as they are welcomed by a powhiri. 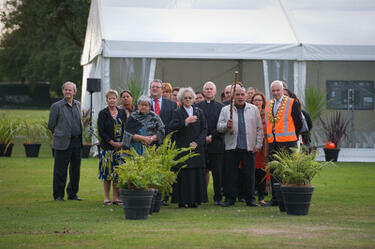 The ceremony was held in Burwood Park. A powhiri performed by Ngai Tahu elders to welcome workers of the Stronger Christchurch Infrastructure Rebuild Team (SCIRT). 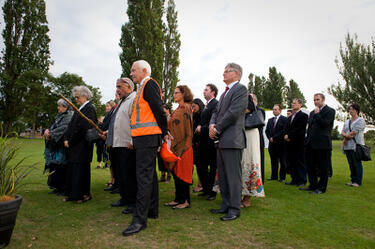 Reverend Peter Beck and Earthquake Minister Gerry Brownlee can be seen standing amongst the group. 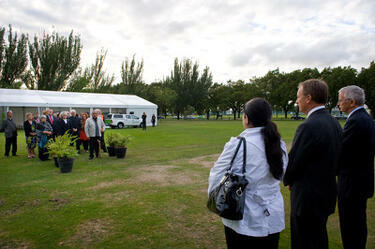 The ceremony was held in Burwood Park. 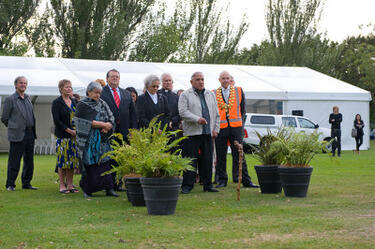 Ngai Tahu elders performing a powhiri to welcome workers of the Stronger Christchurch Infrastructure Rebuild Team (SCIRT). Mayor Bob Parker is standing to the right. The ceremony was held in Burwood Park. 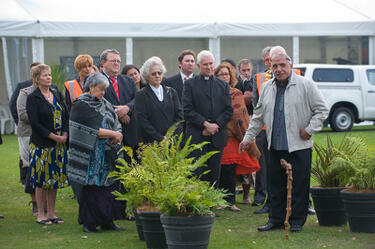 A powhiri performed by Ngai Tahu elders to welcome workers of the Stronger Christchurch Infrastructure Rebuild Team (SCIRT). Mayor Bob Parker is standing to the right. 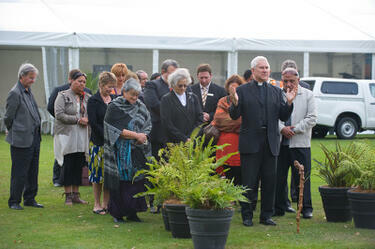 Reverend Peter Beck and Earthquake Minister Gerry Brownlee are also present. 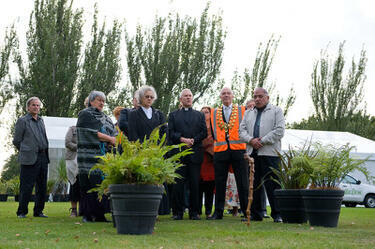 The ceremony was held in Burwood Park. Ngai Tahu elders performing a powhiri to welcome workers of the Stronger Christchurch Infrastructure Rebuild Team (SCIRT). 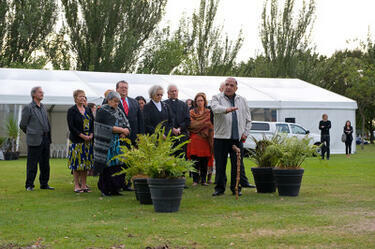 The ceremony was held in Burwood Park. 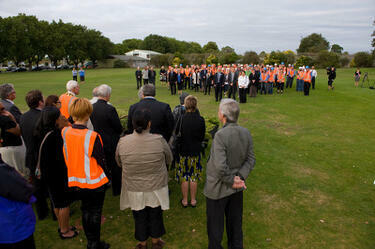 Reverend Peter Beck leading a prayer at the Stronger Christchurch Infrastructure Rebuild Team (SCIRT) opening. Mayor Bob Parker is standing to the right of Reverend Peter Beck. The ceremony was held in Burwood Park. A powhiri performed by Ngai Tahu elders to welcome workers of the Stronger Christchurch Infrastructure Rebuild Team (SCIRT). 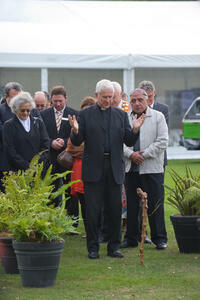 Reverend Peter Beck is standing in the centre and Earthquake Minister Gerry Brownlee to the left. 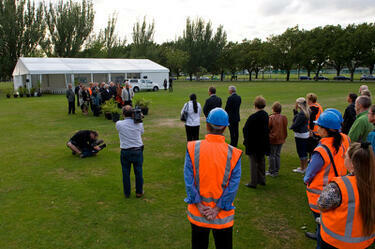 The ceremony was held in Burwood Park. A powhiri performed by Ngai Tahu elders to welcome workers of the Stronger Christchurch Infrastructure Rebuild Team (SCIRT). Phil Goff is standing in the centre of the group that is being welcomed. The ceremony was held in Burwood Park. 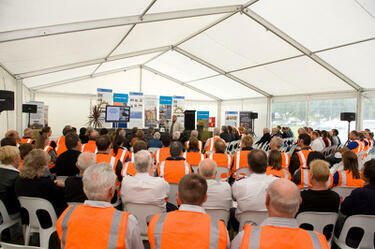 A Ngai Tahu elder presents to politicians and the Stronger Christchurch Infrastructure Rebuild Team (SCIRT). The ceremony was held in Burwood Park. 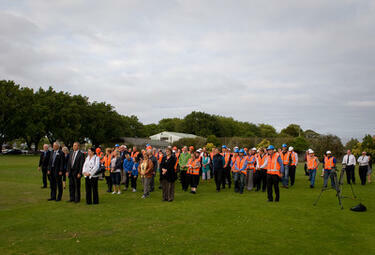 Reverend Peter Beck leading a prayer at the Stronger Christchurch Infrastructure Rebuild Team (SCIRT) opening. The ceremony was held in Burwood Park. A powhiri performed by Ngai Tahu elders to welcome workers of the Stronger Christchurch Infrastructure Rebuild Team (SCIRT). Phil Goff is standing in the centre of the group that is being welcomed. Two cameras are filming the welcome. 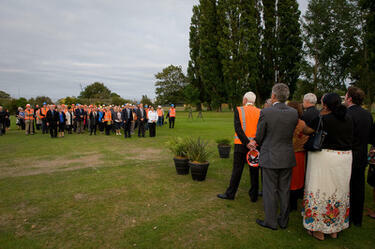 The ceremony was held in Burwood Park.